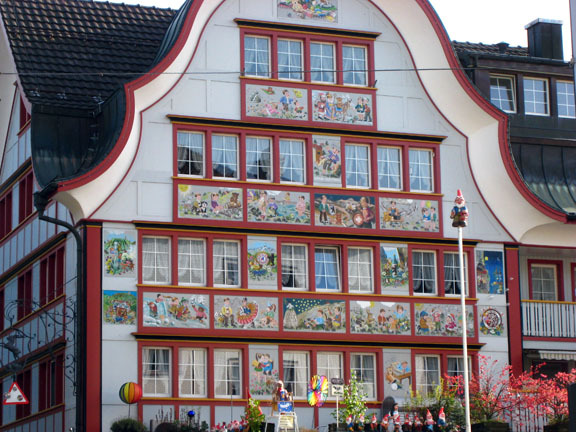 We recently sent Ryder-Walker guest Lisa Allen to the Appenzell region of eastern Switzerland. To say that she’s enjoying herself would be an understatement. She sent us the following note. Enjoy! I am in Paradise! No, not that one! The OTHER one! Yesterday, in a town near Appenzell, called Weissbad, I finally SAW IT! Shepherds and boys in FULL Swiss “dress” AND their APPENELLER MOUNTAIN DOG bringing cattle back to the farm!!!!!! IT WAS BREATHTAKING!!!! And, in Appenzell, on October 4, I shall be present for the CATTLE SHOW!!!! Today and tomorrow, there are Swiss choirs playing, in FULL SWISS dress, on traditional instruments, all over town and the music carries me to another realm. They are having a huge competition. The food, the coffee, the cheese, all AMAZING!!! Eleven men played alphorns in the center of town an hour ago!!!! I am wearing my Swiss Berner Club 100th Anniversary pin and carrying pictures of the Berners and Appenzeller! I LOVE IT HERE but, after 8 days, I must return to the USA next week. Lisa Allen, from Heaven on Earth, Appenzellerland.